Rolled threads have improved physical characteristics, greater accuracy and a high degree of surface finish. They are uniformly produced at high rates of production with no wasting of material. These six major advantages account for the increased use of thread rolling. The cold forging that threads receive during the rolling process strengthens them in tension, shear, and fatigue. The cold working of the surface increases the tensile strength of the metal worked, and static tensile test have frequently recorded increases on the order of 10% in the breaking strength of the parts. 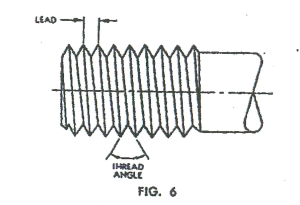 When a thread is rolled the fibers of the material are not severed as they are in other methods of screw thread production, as shown in Fig. 3, but are re-formed in continuous unbroken lines following the contours of the threads, as in any good forging as shown in Fig. 4. Rolled threads resist the stripping because shear failures must take place across rather than with the grain. Thread rolling increases the part’s resistance to fatigue failure in several different ways. Rolling between smooth dies leaves the thread with smooth burnished roots and flanks, free from tears, chatter or cutter marks that can serve as focal points of stress and, therefore, starting points for fatigue failures. Rolling also leaves the surface layers of the thread, particularly those in the roots, stressed in the compression. These compressive stresses must be overcome before the tensile stresses can be built up, which alone, can cause fatigue failures. This increase in root hardness, up to 30%, adds considerably to the parts resistance to fatigue. It has been repeatedly demonstrated that any fastener that is properly tightened when it is installed, and remains tight throughout its life, is less likely to fail by fatigue than one that is assembled loosely, or that becomes loosed in service. Threads produced by any of the cutting methods have a surface condition consisting of partly torn-away particles that gradually bear down in service permitting the fastener to loosen. Rolled threads, on the contrary, which are compacted and burnished during threading, are less prone to loosen, and, thus ordinarily have longer fatigue lives. Rolled threads show no loss of fatigue strength when heated for several hours to temperatures up to 500° Fahrenheit; whereas, fatigue strengths of threads produced by other means are lowered by as much as 25% by the same treatment. Improved fatigue strength, resulting from all the above factors, is reported to be on the order of 50-75%. On heattreated bolts from Rockwell C36 to 40 hardness, that have the threads rolled after heat-treatment, tests show increased fatigue strength of 5 to 10 times that of cut threads. 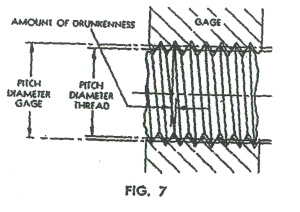 The production of accurate threads normally requires that close control be exercised over pitch diameter, thread angle, lead, taper, roundness and drunkenness. The accuracy of the thread angle and the lead produced, as shown in Fig. 6, is almost entirely dependent upon the accuracy of the dies. In most cases, the thread angle and the lead of the thread on the die is exactly reproduced on the material rolled. The accuracy of the lead produced can also be influenced by the setup of the dies and the material being rolled. Some types of harder and stiffer materials have a tendency to “spring back” after rolling with the result that the lead on the work may be contracted a very small amount. In such cases, dies with expanded lead may be used and will uniformly produce threads of the correct lead. The control of drunkenness is dependent upon using dies with correct lead angles and upon careful matching and proper feeding and positioning of the blank in relation to the dies. Refer to Fig. 7. 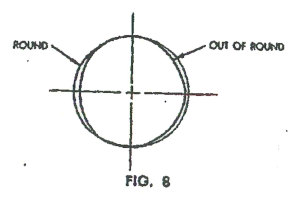 Roundness is dependent upon the roundness and uniformity of hardness of the blank and upon the rate of application and release of the die pressure. If the dies are designed and setup to apply and release pressure gradually and uniformly, close tolerances on roundness may be steadily maintained. Refer to Fig. 8. 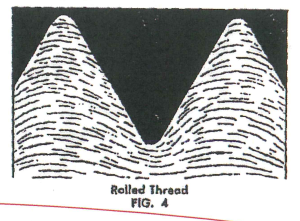 If sufficient care is used, it is possible to produce extremely accurate threads by any of the common threading methods, but rolling is unique in its inherent ability to maintain the accuracy of the original setup during long runs of high speed production. appreciably during the entire life of the dies. 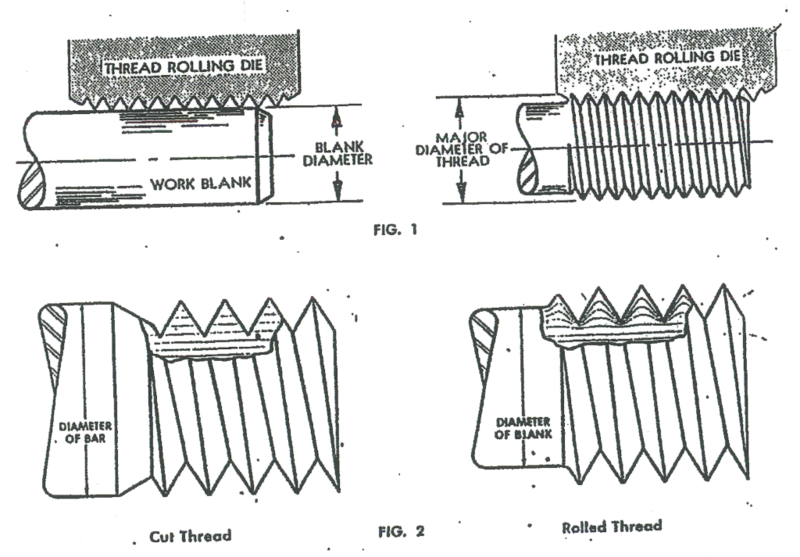 Thread rolling dies do not wear out in the same manner as do other threading tools. Wear, instead of being concentrated on a sharp cutting edge, is distributed over a broad surface, and the rolling action is relatively free from friction. Therefore, the thread form of a rolling die is not changed by erosion, not does it fail to reproduce itself because of dullness or adhesion. It cannot be altered by improper sharpening, as sharpening is never required. The development of the thread rolling process and the thread rolling equipment is by no means completed. On the contrary, there is more interest and activity in the process now than at any time in its history. New types of machines and attachments are constantly being developed, and the process is daily finding new applications where its speed, accuracy, uniformity, and the strength that it adds to the parts rolled, can be used to reduce costs and improve the quality of an endless number of threaded parts. Thread and form rolling is a simple cold forging process confined almost entirely to external threads. It is referred to as a cold forging process because most rolling is done on cold blanks. However, rolling of threads or heated blanks has been beneficial on some applications. Today, thread and form rolling is accepted by many industries as a preferred method of producing uniform smooth, precise threads of superior physical qualities. (Fig. 1). The working faces of the dies have a thread form which is the reverse of the thread to be produced. In penetrating the surface of the blank, the dies displace the material to form the roots of the thread and force the displaced material radially outward to form the crests of the thread. The blank has a diameter part way between the major and minor diameter of the thread. 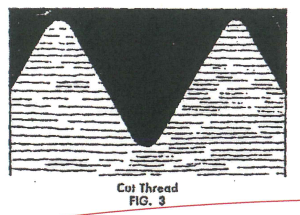 A comparison of cut and rolled thread is show in Fig. 2. Unlike the other threading processes, no material is removed and consequently no chips are produced.